The political process is key to solving the crisis in Syria, participants at the Vienna talks on the Syrian peace process have agreed. They have set a timeframe for Syrian government and opposition forces to create a joint group to work towards a new constitution. Governmental and "the whole spectrum of opposition forces" should gather together no later than January 1, 2016, Russia's Foreign Minister Sergey Lavrov announced at a press-conference in the Austrian capital, following Saturday’s talks. The UN and its Syria envoy Staffan de Mistura have been tasked with supervising the creation of such a group, Lavrov said. The Syrian forces to be represented by a transitional body, the so-called "government of national unity," should work on a new draft constitution and hold new elections within the next 18 months, Lavrov said. "This will be a Syrian-led process," and only Syrians themselves can choose their country’s future, the Russian diplomat said after the meeting, which was held in a sombre atmosphere following Friday’s terror attacks in Paris that claimed over a hundred lives. Lavrov and his US counterpart John Kerry have been "a great inspiration" in the "productive" Vienna meeting, Staffan de Mistura said. "To those in Paris yesterday who have planned through that horror to actually influence or depress the intention of the international community in doing something constructive in Syria, the response was today," the UN official said. 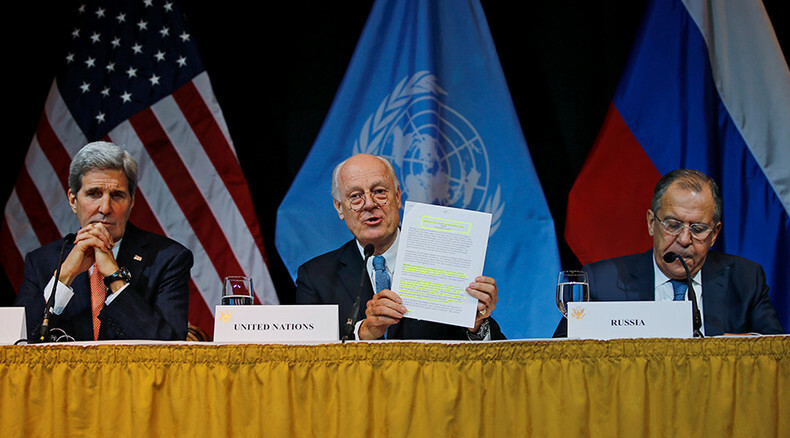 The UN is ready to assist with the political process starting "at any time," de Mistura told journalists, adding that he had been informed by the Syrian government that they were ready with their representative delegation. "The opposition needs to come up and we will help them," he said. Not everyone in the region is ready for an immediate ceasefire, he added, but mentioned that it has been agreed that the violence should come to an end and be "parallel" to the process of political transition. "Momentum is the key word," the UN official said. The ceasefire does not apply to terrorist organizations in the region, including Islamic State (IS, formerly ISIS/ISIL) and Al-Nusra Front. Russia has been calling for a political process to be launched in Syria for years, "but there were a lot of opponents to that," Lavrov said, adding that he is satisfied an agreement has been finally reached. Although participants at the talks disagree regarding the future of Syrian President Bashar Assad, the sides "are in agreement for the transition process," US Secretary of State John Kerry said at the press conference. 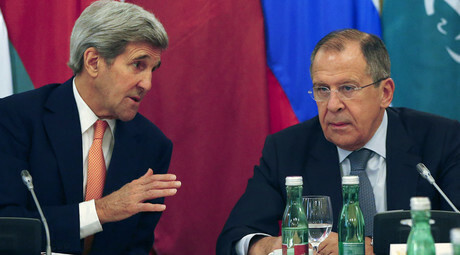 If Assad is prepared for negotiations, he can be part of the that process in Syria, Kerry added. The agreement on the Syria peace process opens the capabilities for wider cooperation between Russia and the US, Kerry added, calling it "a road ahead... to be able to do more." All nations involved cannot allow terrorists to take advantage of their disagreements and let their power grow just because "we can not agree on some things," Kerry said. "The last thing we want to see is [Islamic State] grow because of it," he added. Assad is not "the root of all evil," Russian Foreign Minister Lavrov said, adding that IS "appeared not three but ten years ago." Recent terrorist attacks and IS claims of responsibility for them "show that it doesn't matter if you're for or against Assad - you're ISIL enemy," Lavrov pointed out. Terror groups in the region, including IS and Al-Nusra Front "should become our common legitimate target, for us to fight and destroy them," he added, saying that it has been agreed that a new official list of terror groups should be made and then approved by the UN Security Council. World and regional powers have been involved in the Syrian peace process in Vienna, aiming to find ways on ending a civil war that has been going on in Syria since 2011. The fate of President Assad has been a stumbling block regarding the issue, with the US and its allies insisting he must step down, and Russia saying it's only the people of Syria who can choose a ruling political force for themselves.